There is an old notion around that art shouldn't be too realistic, but should transform, elevate or purify existence in some way. The Dutch painters have accordingly been criticised for their 'low' realism, poor taste and crude humour. I've always been impressed by the fact that the Dutch were the only ones to embrace realism in its fullest sense. I've been particularly attracted to the genre of vanitas still life that the Dutch painters made so much their own. Vanitas deals with death, corruption, decay, decline, failure, loss, transience - almost every aspect of reality we find objectionable. 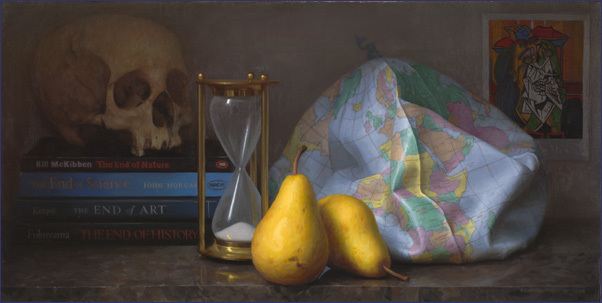 The vanitas painter typically takes skulls, dead animals, rotting fruit, disordered junk, symbols of transience, and paints them with a rich, deep illusionism in which every possible trick is used to draw the viewer in, entangle and implicate him in this entropic vision. Although Dutch vanitas paintings are reputed to embody a 'higher' religious' symbolism directing the viewer to the care of his immortal soul, I've never been entirely convinced and to my mind these pictures work more effectively as invitations to eat, drink and be merry! And as in so much Dutch painting, a gently disruptive, mocking spirit seems to be at work, deflating hubris, celebrating humbug. Although it could never be acknowledged at the time, I see in these paintings evidence of an increasingly secular, materialistic outlook, and a decline in religious feeling. Happy Days, oil on linen, 12 x 24 inches, 2008, private collection. A contemporary vanitas painting, such as my work 'Happy Days' (2008), may seem ambivalent, because it inevitably mocks 'progress' and exposes a deep vein of cultural pessimism that we struggle to articulate through official channels. What has been achieved since the 17th century? The Italian philosopher Giambattista Vico believed that "men first feel necessity, then look for utility, next attend to comfort, still later amuse themselves with pleasure, thence grow dissolute in luxury, and finally go mad and waste their substance." Applied to an Irish context, having briefly been the wealthiest people in Europe, we seem to have moved rather quickly to the 'going mad and wasting our substance' phase. We find the pattern of boom and bust at all sorts of scales in history, from the centuries-long rise and fall of great empires to speculative manias lasting a few years. Looking back to the art of the Dutch Golden Age we see the same pattern of boom and bust, both in violent oscillations of the art market that were enough to bankrupt even the greatest artists, and in the broader sweep; the way Dutch art progressed from humble beginnings through ever-greater displays of luxury until it finally lost its way in dissipation and ceased to generate works of great strength and substance. Now it's rather unfashionable to talk of artistic decline and degeneration; art historians would much rather relate the history of art as one shining triumph after another, but the subject fascinates and bothers me. I don't think our own boom and bust has any great artistic significance, but I do think that what we call 'Western Civilization' is in deep trouble, that European and American dominance of the world is drawing to a close, and that surveying western art of the last hundred years one can find plenty of evidence that we've been going mad and wasting our substance. The Dutch were among the first to enjoy the fruits of Europe's five-hundred-year boom; I suspect we'll be among the last.